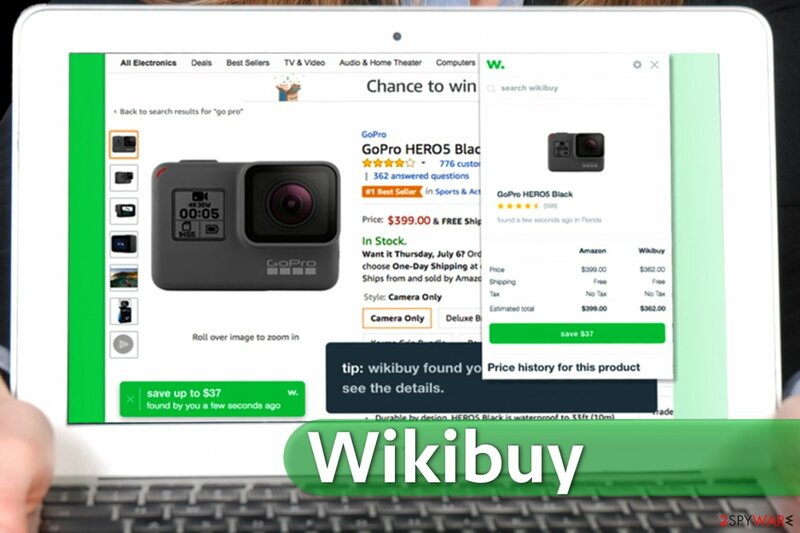 Wikibuy is an innovative Chrome extension that actually enhances the online shopping experience. It is a product of Impossible Ventures, LLC doing business as Wikibuy, LLC. This system tool is a browser extension that is currently compatible with Google Chrome browser only – it means that it works on Chrome browsers installed on any Windows or Mac operating system. The tool also works on iPhone which is a definitely a great feature as you can shop and save on the go! You can download it from official Wikibuy’s website or App Store. If you’re wondering how much money can you save with Wikibuy, we can only say that this system tool will surprise you. We can assure that it is a 100% legitimate and trustworthy application that isn’t ad-supported – it isn’t like annoying and useless adware programs that make empty promises only to deliver fake ads and generate pay-per-click revenue. For more information about bad ad-supported programs, visit VirusActivity site. With this extension, you can actually save money. This browser extension uses an algorithm that checks other online shops such as Target, Walmart, Jet, eBay, Amazon, and others. The extension compares a lot of attributes such as item’s size, color, availability, and of course, price. It even calculates the final price of the item including taxes and shipping. Finally, it searches the web for coupon codes to apply additional discounts. It goes without saying that such variety of helpful features makes this extension a hands-down great time-saver for people who love to shop online. 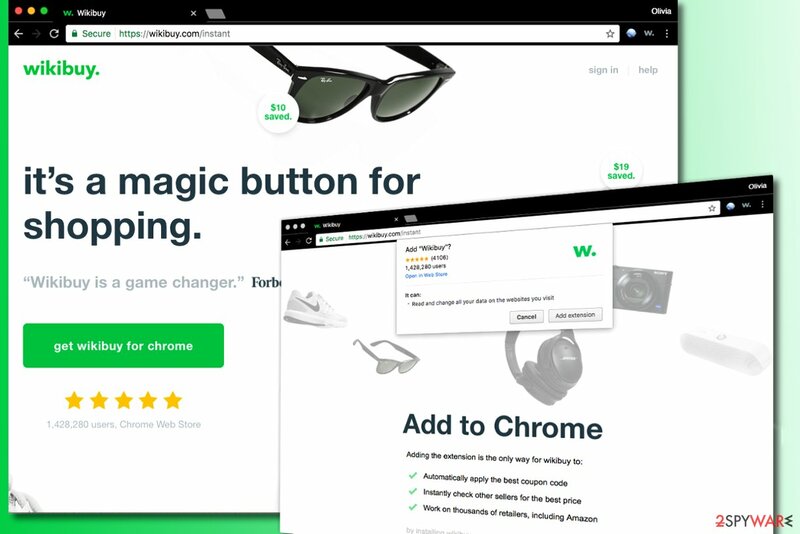 Wikibuy extension for Chrome is 100% free to use and it helps to save money while shopping online. Wikibuy extension is quite new, however, it has over 1,428,280 users worldwide. Besides, the number of positive reviews on Chrome Web Store reveals that this system tool actually has great features to offer. Let’s take a look at the main advantages of the extension and also discuss some disadvantages that show that there’s still some room for improvement. The extension doesn’t ask for any intrusive permissions. It works quickly and delivers a guaranteed offer for a lower price within 15 seconds after you open a product page on any online store. The tool provides an user-friendly interface, allowing everyone to use it without any problems. The tool is a partner of Ebates, which helps to bring even bigger savings for customers. Ebates allows getting cash back when shopping at certain online stores. Refunds always come directly from the company, not the seller. As soon as the vendor receives a returned product, Wikibuy issues a refund to the user’s card. The user usually receives a refund within 1-3 days. Some users noted that the tool saved them less money than it promised. This shows that the tool can be improved, but still works well. It has been observed that the extension misses the expiration of temporary discounts. For this reason, we suggest that you double-check the offer yourself before placing the order. We can only hope that the developers of Wikibuy will arrange some improvements to fix this issue. This virtual shopping assistant tends to provide offers only from reputable sellers on eBay and similar shopping platforms, however, since Wikibuy is responsible for all issues, the time required to solve the issue might be prolonged. In other words, the tool decreases the risk on eBay purchases but doesn’t eliminate them. The extension is likely to provide inaccurate shipping/availability information. Even if Wikibuy lists the product as available, it might be missing in the closest vendor’s warehouse, and consequently, the user has to wait longer for the product to arrive. Unfortunately, the extension is useful only if you’re living/staying in the United States – it can find savings for US addresses currently. However, it promises to work in order to provide savings for foreign customers as well. Wikibuy is clearly an outstanding tool which we believe will be positively evaluated by every online shopper. It does not annoy the computer user, it doesn’t interfere with web surfing, and it doesn’t display ads on your screen when you’re browsing regular websites and not online stores. If you’re willing to save some bucks, we recommend checking out this extension for Chrome. Although it doesn’t work on other browsers, versions compatible with other popular web browsers might appear shortly. If you did not like the extension and you’re wondering how to remove WikiBuy, you can do it in a few simple steps – just enter chrome://extensions in Chrome’s address bar and delete the right entry from the Extensions panel. ^ Lucia Danes. Microsoft Edge’s chances to become Chrome’s rival are close to zero. UGetFix. Computer Fixes, Tutorials, News. ^ Virus Activity. Virus Activity. Cyber Security News, Trends, Analysis. This entry was posted on 2017-07-04 at 08:07 and is filed under System tools, Viruses. You can quickly scan the QR code with your mobile device and have Wikibuy add-on manual removal instructions right in your pocket. How did you remove Wikibuy add-on?